Doha/Qatar, 12 Feb: The newly-elected president of the Indian Cultural Centre (ICC) Manikantan A P announced the portfolios of the office bearers of the new management Committee. Rajesh Kamble, counselor – Embassy of India - Qatar and coordinating officer of ICC, approved the proposal in the first meeting of managing Committee which was held at the ICC premises. 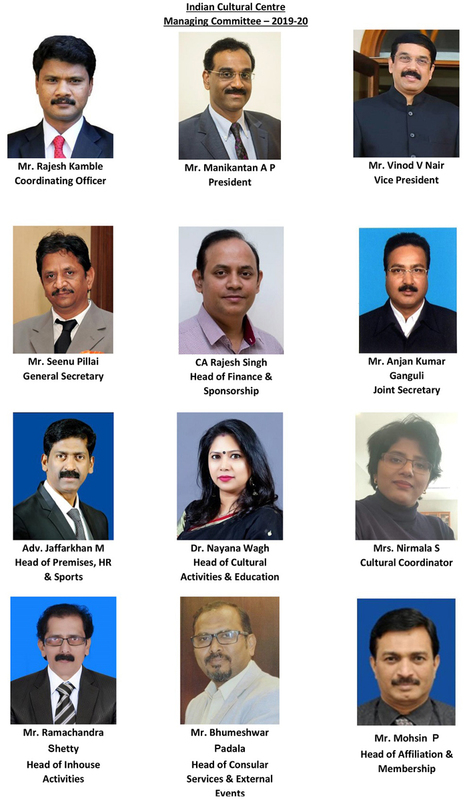 The team now has Vinod V Nair as vice president, Seenu Pillai as general secretary, Anjan Kumar Ganguli as joint secretary, Rajesh Singh as head of finance and sponsorship, advocate Jaffar Khan M as head of HR, premises and sports, Dr Nayana Wagh as head of cultural activities and education, Nirmala Shanmugapandian as cultural coordinator, Ramachandra Shetty as head of in-house activities, Bhumeshwar Padala as head of consular services and external events and Parambathkandi Mohsin as head of affiliation and membership. The tenure of the managing Committee is for two years and Committee will be working closely with the Embassy of India on various cultural events, in a busy year ahead with 2019 being a Qatar - India Year of Culture. The president also updated the immediate plans to improve the facilities at ICC, better ambience of the premises and smooth coordination with the associated organizations He also spoke about revamping the ICC website to be more user friendly and development of the Mobile App for ICC. Indian Cultural Centre is the apex body of Indian expatriate community functioning under the patronage of Embassy of India for the purpose of advancement of social and cultural activities of the Indian community in Qatar. This cultural body is also committed to promote the rich Indian culture among Qatari nationals and expatriate communities of all other nationalities living in Qatar. It also functions to support the Indian Embassy to strengthen the deep-rooted Indo-Qatar friendship and cultural relationship.